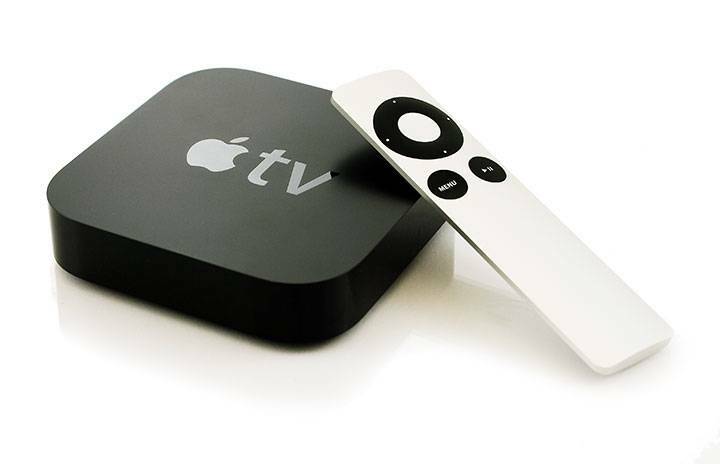 Apple TV is a digital media player and microconsole developed and sold by Apple Inc. It is a small network appliance and entertainment device that can receive digital data from a number of sources and stream it to a capable television. Apple TV is an HDMI-compliant source device. To use it for viewing, it has to be connected to an enhanced-definition or high-definition widescreen television via an HDMI cable. The device has no integrated controls and can only be controlled externally, either by an Apple Remote control device (with which it is sold) using its infrared/bluetooth capability, by the Apple TV Remote app (downloadable from App Store) on iOS devices, such as the iPhone, iPod Touch, iPad, and Apple Watch, using its Wi-Fi capability, or by some third-party infrared remotes. Its Wi-Fi capability is also used to receive digital content from various iOS apps using AirPlay or directly from the iTunes Store, which is then streamed to the TV. It also plays digital content from the iTunes Store, Netflix, Hulu, Now TV (UK only), SlingTV, PlayStation Vue, Amazon Prime Video, DirectTV, YouTube, and Vevo along with HBO Now, Showtime Anytime, Starz, and the TV Everywhere portals of several cable and broadcast networks, and the video subscription portals of three of the four major North American sports leagues: MLB.tv, NBA League Pass, and NHL.tv. It plays content from any macOS or Windows computer running iTunes. Apple began to promote the Live Tune-In feature that allows the viewer to ask Siri to tune to live streams of CBS, ESPN, and Disney XD among many others that support Live Tune-In. The 4K HDR era. Now playing. Everything you watch. All in one place. Get even more from your Apple TV. Game controllers, speakers, and headphones are just a few of the accessories that will make your Apple TV gaming and entertainment experience even better. Buy online and pick up available items today. Item Description is not met. If any payment has been made on any item. The buyer can choose to cancel Anytime and request for cash-back before receiving item. For items that carries payment of token. Buyer can choose to cancel and request for money back(Token) before item gets to buyers location. If after attempting 3 failed deliveries within a week after item gets to buyers location the buyer forfeit the token.